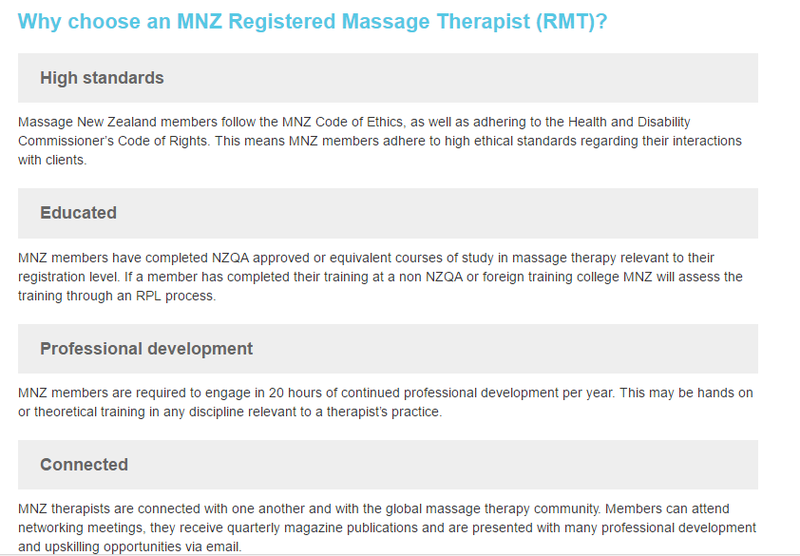 Unfortunately, the massage therapy profession is not government regulated in New Zealand. This means that basically anybody can set up a business or work as a massage therapist with either very little or no training at all and can lead to a lot of confusion about who you should see and why – so how do you know? Luckily there is a self-regulating organisation, called Massage New Zealand, where only fully qualified therapists with applicable qualifications are accepted as members and form a group of professionals that help to keep the massage therapy standards throughout NZ high. So when you visit a massage therapist anywhere in New Zealand, what should your first question be? You should be asking what qualifications they have and whereabouts they gained these from. Most massage therapists will be more than happy to speak to you about their education background and past experience because many of us wear it as a badge of honour and take pride in the fact we have done the work to become professional in what we do. Why is this important? Well, an under-qualified therapist may not have the skills or knowledge to assess you properly and they also may not even know what muscle they are working on or what its attachment points are for example. Qualified massage therapists spend months and months learning muscular anatomy, tests and treatment techniques, as well as learning how to pick up things that aren’t muscle related or are contraindicated and need to be referred on to another health professional. You can check out the Massage New Zealand website HERE and their find a therapist section is handy for finding a qualified therapist near you and you can be safe in the knowledge that they know their stuff as there is a huge difference between doing an 18-month course and a 2-week course. Demand only the best because your health and well-being depend on it.